AOC, officially announces their first G2 Esports branded monitor – the G2590PX/G2. Made possible through a collaboration between AOC and G2 Esports, one of the most powerful and successful esports organisations worldwide, this monitor’s new special edition features a unique design with the official G2 Esports samurai art and logos. This 24.5” monitor will also be equipped with high performance gaming features such as 144Hz, 1ms response time and Free Sync. Based in Berlin, Germany, and founded in 2013 by renowned pro player Carlos ‘ocelote’ Rodríguez, G2 Esports quickly established themselves as a titan of the European circuit at various international esports events. Since partnering up with AOC in January 2018 to further reinforce their success, G2 Esports’ training facilities have been equipped with AOC’s cutting edge gaming displays. With the release of the new G2590PX/G2, both AOC and G2 Esports will be taking their successful partnership to the next level. “This monitor is not only a sign of AOC’s appreciation for such successful organisation as G2 Esports, but also support to all fans and enthusiasts of all G2 Esports players.” - says Stefan Sommer, Director Marketing and Business Management at AOC International Europe. Based on the acclaimed G90 Series of AOC Gaming monitors, the G2590PX/G2 boasts a frameless TN panel with 16:9 Full HD (1920x1080 pixels), FreeSync support, 1 ms response time and high refresh rates of up to 144 Hz. With the G2590PX/G2 AOC demonstrates how a display can combine performance, style and affordability into one package while continuing to ensure a smooth, tear and stutter-free gameplay experience. 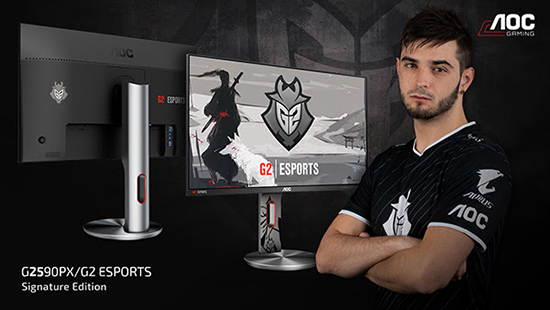 The G2 Esports Signature Edition is now available for retail at a price point of $419.00 - €369.00 - £329.00.